Drones have actually changed our selfie experience in many ways, and more innovation continues to emerge. Selfie Drones continue to wax stronger, as it demand keeps increasing in the consumer market. As the technology continues to improve, Drone Manufacturers are getting better at cramming all those sensors and chips into smaller packages, these improvements have made it possible to produce a more portable and consumer friendly drone that offers needed features and convenience. They have control options that make taking pictures and videos easy for anyone. These new models with integrated cameras come in flat, foldable and compact designs. Made to be more portable than larger models with comparable features and this mobility factor makes them more appealing to many consumers. These smaller flying cameras let you capture selfie shots from a unique perspective and are a big part of why Selfie Drones have started to grow in popularity. Selfie Drones come in a variety of designs, most are slim or compact. Some are pocket size and foldable. All are designed with portability in mind. They can be easily packed or carried and once launched, position itself correctly, do it’s task and return. Some will even let you share your shots on social media with the push of a button. Most selfie drones are controlled using an APP you install on your smartphone or tablet, with programmed flight modes. Like “selfie mode” to make taking pictures and videos easy for anyone. Great for newbie pilots who want to focus on getting that perfect “DRONIE” rather than worry about positioning the drone. The combination of ‘drone’ and ‘selfie’ has brought about a new Air Drone Craze known as the dronie. The most popular “dronie” can be shot by having the drone focusing on you or your group and then backing out to reveal your location. While selfies are cool, “dronies” provide that “WOW” factor. Portability: Convenient and easy to carry around as your smartphone. Ease of Use: Controlled by a APP on your smartphone and with a few simple taps, your up and flying. Some even have APPs that let you edit and share to social media. Image Quality: Even with selfie drones, you can get professional 4K camera quality. Follow Me Mode: Most now offer this popular feature. You can set the drone to follow you from behind, or focus on your face from the front or even do a fly around. This is about as autonomous as it gets. Precise Positioning: Some models have vision sensors to keep it precisely in place, even without GPS. Facial Recognition: Gives them the ability to focus on your face or the face of another for a very clear selfie image. Gesture Control: To take a selfie, simply create a picture frame with your hands, it will recognize this shape and take a photo of you. 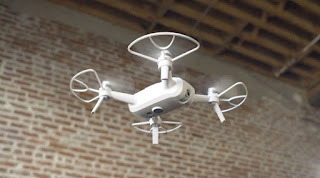 Currently most Selfie Drones use a companion app on your phone for control, the new trend “gesture control” seems to be a more user friendly option and the next improvement will probably be more voice control options. The average consumer wants the ability to record their memories anytime and anywhere. Most people take selfies when they’re on the go while doing something interesting with friends and family. Events like Birthday Parties, Family Reunions, Holidays, Backyard Parties and Picnics. A Selfie Drone can be a great way to capture these moments and share them on your social media sites. Campers and Hikers, or anyone that enjoys outdoor activities can launch a selfie drone up in the air to capture themselves in action or get a unique background shot of a spectacular view. These are just a couple of suggestions to keep in mind before flying your drone around others. 1. Like any new item you purchase, take time to read the operating manual. 2. Practice flights will get you get familiar with the features. 3. Be aware of the flying area, not all selfie drones have obstacle avoidance feature. The chart below list some of the Best Selfie Drones on the market, Use this handy table to compare each model. Sorted from the cheapest to most expensive. These are some of the most popular models now available. The H37 Elfie has fold in arms for easy transport. When folded up it is roughly the size of a large smartphone. Controlled by App, available for both android and ios phones. Using the gyro sensors allows you to fly the drone by tilting your phone, or you can use the on-screen joysticks. There is no memory card slot available on this model, Videos and pictures you capture are stored directly on your phone’s memory. Offers altitude hold, headless mode and one key return along with three speed modes – fast, medium and slow, The Elfie can also do flips with the push of a button. You can expect a range of 50 feet or so and a flight time of about 8 minutes. A low cost alternative for anyone that wants to try a selfie drone for the occasional Dronie. It does not have the best camera quality out there, but it is about what you can expect for the price. The ZEROTECH Dobby is another smartphone-controlled drone, this pill-shaped drone with folding props is small enough to fit in your back pocket or carry in a bag. While using the app you will get a first person view from the Dobby’s camera. You can also use the app to post your drone selfies to Facebook or other social media quickly and easily. It is also responsive to hand gestures and voice commands. Control DOBBY’s flight path by waving your arm – it will follow the direction of your arm’s movements. It can be launched from your hand with a voice command spoken into your phone. The HD camera can swivel 90 degrees and has four preset positions. Offers 4k resolution and 13 megapixels producing 1080p HD videos. The Dobby uses 3 axis image stabilization software to help stabilize your videos. There are a few different flight modes, like burst mode, time delay mode and selfie mode. In selfie mode it will travel upwards at a preset angle and then come back to you while recording a unique selfie video. With the GPS setting, you can draw a flight path for the drone to follow. It also has target tracking and facial recognition software that enables the drone to follow you. It is not exactly the cheapest selfie drone out there, but has great features at an affordable price. The Yuneec Breeze is a compact Smart Drone with Ultra High Definition 4K camera capable of recording aerial videos and crystal clear shots. Incredibly easy to use, has 5 automated flight modes: orbit, follow me, selfie, pilot and journey. Its relatively small size enables it to be flown both indoors and out. No need to worry about crashing into walls or furniture due to its positioning sensors which allow it to hold its position steady no matter where it’s currently flying. Offers 12 minutes of flight time and roughly a 50 meter operating range. Controlled by a companion smartphone app, available for both the iOS and Android platforms. View a live stream and even capture photos and video with the ease of a click. The app also makes social sharing of images easier. 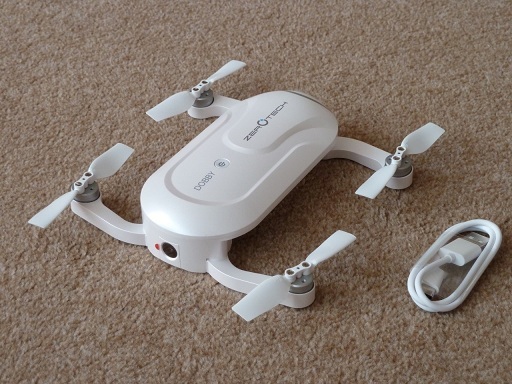 A reasonably priced compact drone that offers portability, ease of use and easy social plugins. The Wingsland S6 has four folding arms and an ultra-thin body design, its compact form makes it easy to store and carry. Featuring a 13MP low distortion camera, mounted on a 3-axis gimbal for improved stability, the S6 is the world’s thinnest 4K drone. It can go up to 10 minutes on a single charge and its maximum operating range is around 100 meters. The S6 is controlled with a companion smartphone app that provides many standard features. Like intelligent orientation control, auto return home, follow me and one-key takeoff/landing. The APP also provides other interesting features such as beautifying your shots, cutting videos, adding music and even emojis to your shots and videos. Available in six colors, the S6 can be customised with the addition of compatible accessories like a search-light and a harmless but hugely entertaining toy gun attachment that you can use to launch projectiles on targets. 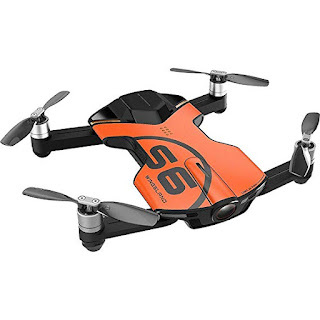 The S6 is ultimately a compact drone with emphasis on having lots of fun, mixed with a little harmless mischief. The DJI Spark offers gesture recognition and obstacle avoidance technology, along with a 12MP camera and 16 minutes of flight time. Control Spark by using a mobile device and gesture controls or purchase a remote control sold separately. When paired with the new DJI goggles, users can experience real time FPV flying. 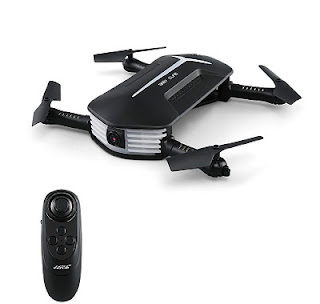 Includes the best technology and features of its bigger brothers, being small, lightweight and portable makes it very quick to get into the air. DJI realized that some people might be intimidated by drones and took steps to make Spark very user friendly. These options such as TapFly, ActiveTrack and QuickShot let users send it into the air and take amazing pictures and video with pre-defined flight paths, like circling, following, or filming from straight up. In addition, Spark has safety features that you normally only see on bigger drones. Things like Return to Home, Precision hovering and landing, not to mention obstacle avoidance, which until now was unheard of in a quadcopter this small. It’s not an exaggeration to say that the Spark is probably the most user-friendly selfie drone on the market today. Packed with features and made by the number one seller of consumer drones in the world, the Spark is a great choice for anyone looking for a quality built selfie drone. 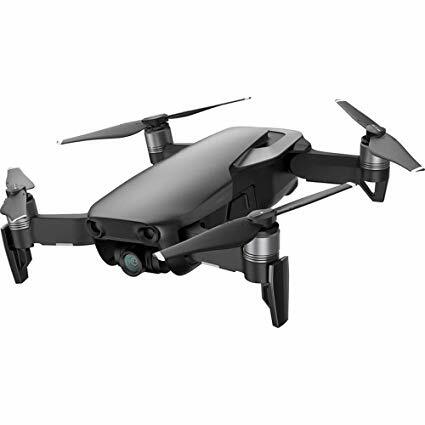 The New DJI Mavic Air has been getting some great response from buyers and very likely to be the top selling consumer drone of 2018. Perhaps there best consumer model to date. It combines the best features of the Mavic Pro and the Spark in a compact, easy to carry design. The Mavic Air is small, lightweight and comes with a high quality 4K camera. It can be flown with gesture control, like the Spark and it’s foldable for easy storage, like the Mavic. Advanced Pilot Assistance Systems (APAS) that allows the drone to fly over and around obstacles. 21-minute flight time, and more. In short, it’s a drone that’s really easy to fly, with features and a price tag many consumers will find appealing. 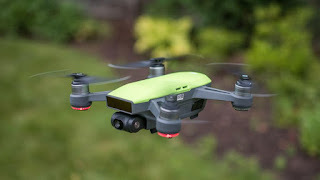 These drones are new and people are beginning to catch up with them because it is really another episode of digital life that makes picture lovers go crazy. I hope to see your selfie drone pictures soon.